A Saturday walk by the other big lake around my home city. This is from before New Year's and it was quite warm and wet, not really the most beautiful weather to be honest. 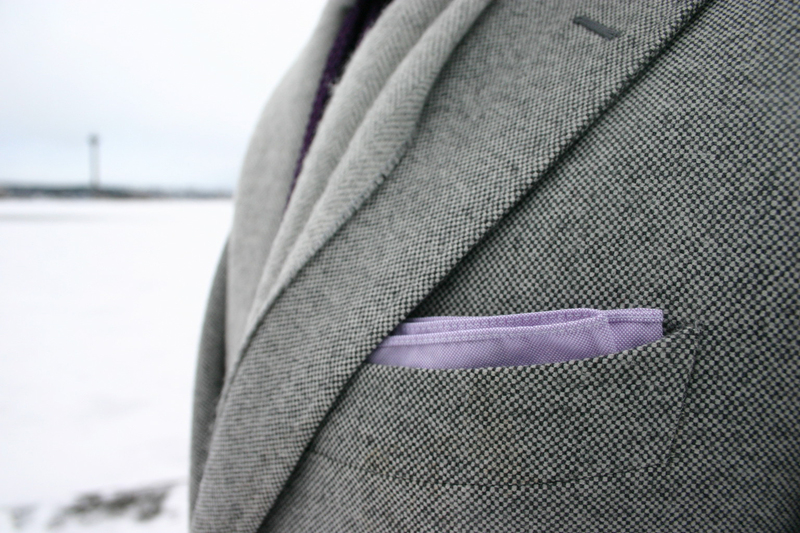 The salt and pepper wool cashmere jacket is from SuitSupply, one that I haven't been wearing that much lately. 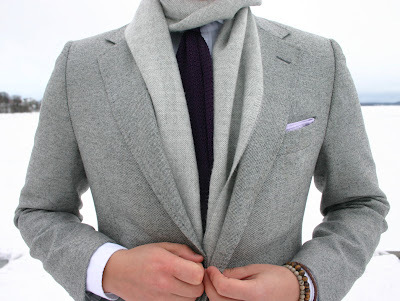 The other items include a light grey herring alpacca scarf, purple silk knit tie, white shirt, Equus Leather bridle leather belt, raw denim, grey wool socks and Meermin longwings. 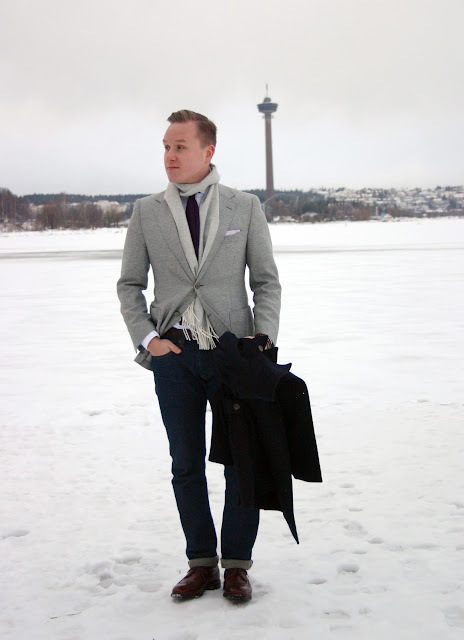 SuitSupply peacoat on top. The tie and the pocket square seemed like a good idea when I left home. Looking at the pictures I realize I should've looked at a mirror. More stuff coming tomorrow and at the start of the week, including some nice shots and a review of my two new Equus Leather belts. Perfect casual outfit. What I wear pretty much every day. I just don't get why I don't see more young men dressing like this instead of sneakers+horrific fitting jeans. I mean I see a lot of pictures over the internet, I just don't see them in person, even though I travel quite a bit. Thanks mate. It is far from my own favorites, but I suppose gets the job done. I'm glad you don't see the sneaker thing in the Nordic countries, but I agree, running shoes are the thing I hate the most (obv they are alright for sports). Gotta love your honesty and humor when you say you should have looked in the mirror! That happens to everyone. And have to agree with Vali, menswear has became too informal. Yoy rarely see a well dressed man. Either a boring and imposed navy suit, black shoes and tie or sneakers and baggy jeans. But we have to look at it positively. The rare few who dress well get more noticed. Heh, to be honest, the light and dark purple there don't really play ball.